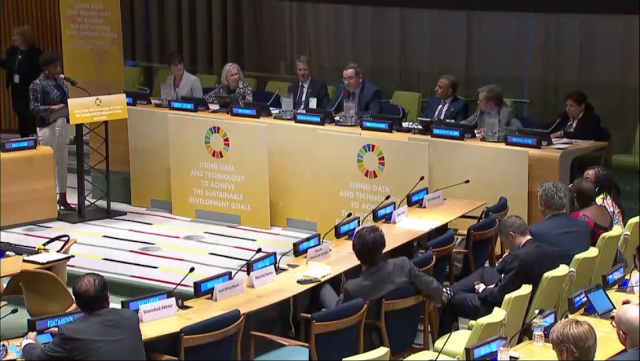 Last week, September 19th, the GSMA announced, at the United Nations General Assembly Week in New York, new developments in its Big Data for Social Good Initiative. Eduardo Navarro, President and CEO of VIVO (Telefónica Brazil), took part in the panel where the main focus was on finding new ways to use technology for the benefit of sustainable devlopment. The first good news announced this week is that Megafon, Telenet and Safaricom have signed on to the initiative, joining previously announced operators Bharti Airtel, Deutsche Telekom, Hutchison, KDDI, KT Corporation, Millicom, MTS, NTT DOCOMO, INC., Orange, SK Telecom, Telefónica, Telenor, Telia, Turkcell, Vodafone and Zain. Therefore, today, The “Big Data for Social Good” initiative is now backed by 19 companies with a presence in 124 markets around the world. Additionally, the GSMA has established an Advisory Panel to provide guidance to the initiative, as well as coordination and integration with the broader ecosystem. The Panel is comprised of the Global Partnership for Sustainable Development Data (GPSDD), the Digital Impact Alliance (DIAL) and Data2X, as well as leading big data experts from UN agencies including Be Healthy Be Mobile, a joint initiative by WHO and ITU, OCHA, UN Global Pulse, UNDP, UNHCR and WFP. The Advisory Panel will play a fundamental role in identifying where, when and how mobile big data can best support health and humanitarian efforts. In Telefónica, we believe that it is possible to invest in a model of innovation squarely focused on addressing the most pressing social and environmental issues in a way that contributes to the success of the business. This is what we call “sustainable innovation”. We also believe that the best way of building value for our Company in the long term is ensuring in parallel a positive impact on the society or the environment. For that reason, from the beginning, Telefónica has embraced the Sustainable Development Goals initiative as a tool to structure our contribution to global development, actively contributing to widespread key goals with internal and external initiatives and supporting projects, which aim to tackle these targets. During the last 10 years, Telefonica has been working on proving that data can be used to improve, not only business capabilities, but also the society. A data-driven approach can be taken for each and every one of the Sustainable Development Goals, using data to measure how the public and private sector are progressing, as well as helping policy makers to shape their decisions and have the greatest social impact possible. With billions of mobile devices and internet connections around the world and new data analytic capabilities, we can use our own internal data together with external information to give back the value of data to our customers and contributing simultaneously to achieving the Sustainable Development Goals set by the UN for 2030. That is the reason why , in 2016, Telefonica proposed to GSMA the initiative Big Data for Social Good in alignment with GSMA project ‘Connecting everyone and everything to a better future’. Its aim is to engage mobile operators to work together and collaborate in accelerating the industry impact in the United Nations Sustainable Development Goals. Within this initiative, Telefonica during MWC17, jointly with GSMA committed to run a trial in Brazil to showcase the potential of mobile data to face with these global challenges. Other initial trials of Big Data for Social Good for epidemics and environmental pollution are currently underway with Bharti Airtel in India, and Telenor in Bangladesh, Myanmar and Thailand. The GSMA expects to publish the results of these trials at Mobile World Congress in February 2018. 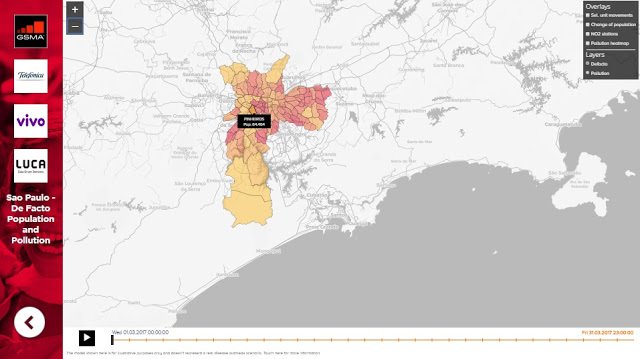 The goal of this project is to run a pilot in a large city in Brazil (Sao Paulo) to demonstrate that our data can be turned into social value, analyzing the city air quality. The pilot is being run from the Big Data for Social Good Unit (LUCA) in collaboration with Telefonica Sustainable Innovation Global Direction (Telefonica S.A), Telefonica Brazil Sustainability Direction (VIVO), Sao Paulo Municipality and GSMA. Other partners will be also invited to collaborate and provide resources and data. To reach the project objectives, it is required to collect and analyze mobile and environment data from sensors, as well as, any other data source that could provide valuable information for this purpose. The project expects to show that correlation of mobile device data location with other datasets will allow to uncover insights and valuable information for local administration about how to improve traffic distribution. Moreover, the trial could come up with additional social and environmental policies that can improve citizen lives. In addition, this project gives Telefonica a stronger “right to play” in the commercial big data space: we don’t use our customer data only for our own benefit, but we use that same data to help improve the world, “giving the data back” to society.